Albion defender Lewis Dunk still harbours dreams of playing for England. The 26-year-old was heavily tipped by fans and pundits to be named in the squad for England’s friendlies against Holland and Italy in March but was overlooked for Burnley defender James Tarkowski and Swansea centre-back Alfie Mawson. 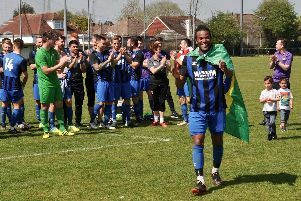 Dunk was named Brighton’s players’ player of the season after a stand-out first campaign as a Premier League player and BBC pundit Garth Crooks feels he is someone the top six clubs should be looking to sign. Last week when talking about the squad he has picked for the World Cup, England boss Gareth Southgate said the players he has chosen are ahead of those not included. Dunk, who captained Albion several times in the Premier League last season, still has his eyes on a Three Lions call in the future and said: “It’s great to hear your name being mentioned with England and that’s my dream now. “I’ve completed one dream of playing in the Premier League and that’s the next one I want to set out to do. “I feel I grew into my own last season, settled into it (the Premier League) quite well and just enjoyed my football.